1 Pillow Encasement: Standard 20×26 in. 1 Mattress Encasement: Twin 39x75x9 in. 1 Box Spring Encasement: Twin 39x75x9 in. Outstanding anti bed bug protection for your home and a great value all rolled into one package deal! Get everything you need to protect your bedding with our top quality SecureSleep™ mattress, box spring and pillow covers. 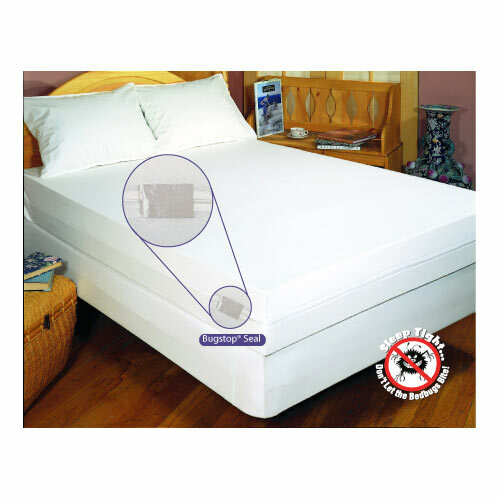 Bed bugs are stopped cold and prevented from moving in or out when you use our premium SecureSleep™ Smart Buy for Home! Entomologist tested, this value option features scientifically designed and patent pending Zip Tech™ zipper technology, with 3-way protection and re-enforced seams. Unlike some products which only cover the mattress or box spring tops, leaving the rest exposed (like a fitted sheet), SecureSleep™ protection fully encases your mattress, box spring and pillow from top to bottom, and has a PVC re-enforced interior lining, making it long-lasting and durable. Also, our products are completely pesticide free, ensuring you and your family have a safe, healthy and secure sleep environment. Bed bugs live on blood, usually human, and look for their meal during overnight hours, while you and your family sleep. Bed bugs are smart and move from location to location swiftly and easily. They hide in cracks in the floor, behind wall frames, in the seams of your mattress, and inside your box spring. Once they sniff out their blood target, they come after it (you) with a vengeance! Covering your bedding with our SecureSleep™ protection prevents bed bugs from making a home in your mattress, box spring or pillow, allowing you and your family to sleep safe — all while protecting your expensive bedding investment. Dust mites are the most common cause for allergies in humans. These tiny, microscopic bugs live deep inside your bedding and can cause allergic reactions that range from mild sniffling or sneezing to severe congestion, eczema and asthma. You will also find pollens, dust, molds, fungus and bio-fluids. SecureSleep™ Smart Buy for Home puts these worries in their place — away from you and your respiratory system!